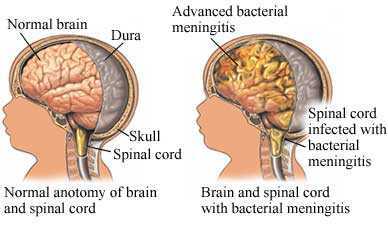 Meningitis is an inflammation of the membranes that are in charge of protecting and covering the brain and spinal cord. There are many things that can cause such an inflammation; causes can range between infection by viruses, bacteria, other microorganisms and, less frequently, by certain drugs. Meningitis is a fatal disease which can be life threatening due to the inflammation's proximity to the brain and spinal cord. This condition is appropriately classified as a medical emergency. Symptoms that come with meningitis are normally headache and stiffness of the neck associated with fever, confusion or an altered version of consciousness, alongside vomiting and an inability to deal with light or loud noises. But in children, the symptoms may be non-specific, such as irritability and drowsiness. Rashes, too, may be used as an indication of meningitis; for example: meningitis caused by meningococcal bacteria can come with a unique rash. Within adults, the most common symptom of meningitis would be severe headaches. This happens with over 90% of all cases of bacterial meningitis, which is then followed by the inability to flex the neck forward in a passive manner due to the increased muscle tone and stiffness within the neck, which is also known as nuchal rigidity. There is a classic triad of diagnostic signs for this disease which start with nuchal rigidity, sudden and abrupt high fever and an altered state of mind. It is important to mention, though, that these three features are only present in roughly half of all the cases of bacterial meningitis. If none of these three symptoms are present, then it is quite unlikely that one has meningitis. As mentioned above, small children do not really exhibit the aforementioned symptoms and may only show signs of irritability and generally looking unwell. But infants around 6 months of age who have meningitis may have a bulging of the soft spot on their heads, otherwise known as the fontanelle. There are some other features which might help in distinguishing meningitis from other less fatal conditions and illnesses in children, such as pain in the legs, cold extremities and an abnormal skin colour. Those affected with meningitis may develop problems during the early stages of their illness. These complications require specific treatment and also indicate severe illness or sometimes, a worse prognosis. The infections may cause a systematic inflammatory response syndrome or sepsis, along with declining blood pressure and a swift heart rate. This may lead to a lack of blood supply to one’s organs. Because of the increasing pressure inside the skull, or intracranial pressure, the brain tissue may swell, which is a condition known as cerebral endema. Treatment for meningitis should begin as soon as possible. Treatment with wide-spectrum antiobiotics should never be delayed while tests to confirm the meningitis are being conducted. If hypotension is present, then intravenous fluids should be administered. Because of the number of complications which come with meningitis, regular medical reviews are recommended in order to identify all complications early on. Statistics point out that about 3 in every 100,000 people in western countries are affected by meningitis.